— Lou Dobbs on Tuesday, August 19th, 2014 in comments on Fox News' "America's Newsroom"
By Derek Tsang on Thursday, August 21st, 2014 at 1:14 p.m.
Lou Dobbs on Fox News on Aug. 19, 2014. Fox News host Lou Dobbs criticized President Barack Obama for not going firsthand to Ferguson, Mo., to calm tensions after the killing of an unarmed 18-year-old African-American by a white police officer. 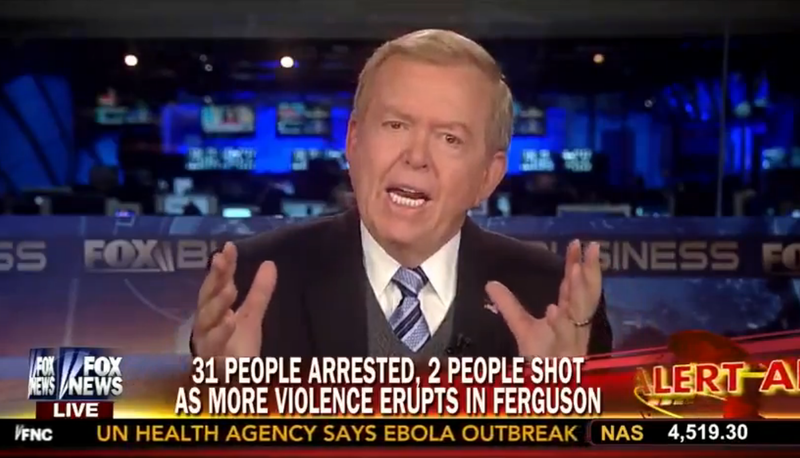 Obama, Dobbs claimed, bears responsibility for the economic issues that have contributed to the tensions in Ferguson. "Black unemployment is three times that of white unemployment," Dobbs said on Aug. 19’s America’s Newsroom. "The community itself has a 13 percent unemployment rate, more than double that of the national average. The household net worth in that community is $10,000, a third less than the national average." "These are the results of policies on the part of the state government, the local community, and the president of the United States," Dobbs said, arguing that President Obama should assure residents that "there will be honest and forthright dealing" with "no ambiguity about the conclusions." Obama needs to see, Dobbs said, "what happens when you don’t push job creation, you don’t push prosperity for all Americans." Linking Obama’s economic policy to the tensions in Ferguson, a town of 21,000, is a fairly significant charge. So we wanted to check Dobbs’ claim that because of Obama’s failure to "push job creation," the black unemployment rate in Ferguson is three times higher than the white unemployment rate. The most recent unemployment figures for Ferguson come from the U.S. Census Bureau’s American Community Survey, which asks an annual sample of 1 in 38 households about their demographics, background and finances. Ferguson’s small enough that the Census only produces figures over a three-year period, the most recent of which track 2010-2012. Over that period, 16 percent of the black labor force in Ferguson was unemployed, compared to 8.5 percent of the white labor force. That’s a ratio of about 1.9; not the three times that Dobbs alleged. Dobbs' figure is more accurate for St. Louis County, which includes Ferguson. In 2012, St. Louis County had a black unemployment rate of 17.8 percent, 3.1 times the white unemployment rate of 5.7 percent. But Ferguson makes up just 2 percent of St. Louis County in terms of population. Dobbs is also closer if you include Ferguson Census figures from 2008-12. In that scenario, the black unemployment is 2.8 times the white unemployment rate. Natalie Holmes, a researcher for the Brookings Institute, told us the best statistics to use are the Ferguson numbers from 2010-12, because they are both more current and "capture less of the recession." Dobbs is right that Ferguson’s unemployment rate of 13 percent, according to the American Community Survey’s 2010-12 estimates, is roughly twice the current national average of 6.2 percent, according to the Bureau of Labor Statistics. By most measures, Ferguson is not a prosperous town. But the gap between black and white unemployment in Ferguson is nowhere near unique. In July, the national black unemployment rate was 11.4 percent. That’s about 2.2 times the 5.3 percent white unemployment rate, according to the BLS -- a bigger gap, proportionally, than in Ferguson, with the caveat that the numbers from Ferguson aren’t as recent. So Ferguson is reasonably representative when it comes to the racial employment gap. More critically for Dobbs, this isn’t a recent phenomenon somehow created or exacerbated by Obama. Since the BLS began keeping unemployment data by race in 1954, the black unemployment rate has consistently been about twice as high as the white unemployment rate. According to the Pew Research Center, which published the above graph in 2013, the discrepancy between black and white unemployment was highest in the late 1980s, and lowest during the Great Recession. The average ratio between black unemployment and white unemployment since the BLS began keeping data is 2.2 -- exactly what it was in July. Put simply, African-Americans have been 2.2 times more likely to be unemployed since 1954 than whites. Researchers haven’t reached a consensus on why this gap persists: explanations include, according to Pew, "differing industrial distribution of black and white workers," a "skills gap," and the "‘last hired, first fired’ hypothesis." Dobbs goes too far in pinning the blame on Obama. Experts have consistently told us and our colleagues at PolitiFact that although government policies can affect employment figures, other economic factors are typically at play; in this case, the Great Recession and subsequent recovery. And according to Elizabeth Kneebone of the Brookings Institute, Ferguson’s economic downturn over the last decade is a potent example of the general increase of suburban poverty in America as more money flows to urban areas. Dobbs said that because Obama failed to "push job creation," the black unemployment rate in Ferguson is three times higher than the white unemployment rate. First and foremost, Dobbs’ numbers are off. The most recent and best available statistics say the black unemployment rate is 1.9 times higher than the white unemployment rate in Ferguson (16 percent to 8.5 percent). Second, that has little to do with Obama. Since the Bureau of Labor Statistics began keeping data in 1954, African-Americans have been nationwide are more likely to be unemployed than whites. We rate Dobbs’ claim False. Published: Thursday, August 21st, 2014 at 1:14 p.m.